And here’s one of my project pages. I had all kinds of notes scattered everywhere on this one and I love that I can see my progress at a glance. You can make them plain, but I like the ones that have at least a little colorful doodling on them. I’ll keep you posted on how well this works out for me. One of the things that I find is that the urgent things (or at least what I think is urgent) take up space from the things that are important to me. I resolve to improve my machine quilting and then find that a month has gone by and I haven’t even touched my machine. And my blog! I had such great ambitions at the New Year and when checking back today, discover I haven’t updated in over three months. Bad blogger! Just the finishing to do, but they will be looking at that with a fine toothed comb, so I will need to go slowly and carefully. And, closing as I usually do with granddaughter news. Ivy made All State Choir, so in February Abby and I took her down to Portland (I know – the irony of the Washington State Choir being held in Oregon). While she practiced, Abby and I did touristy things, including Powell’s Books. Oh my! Then we joined Ivy that night for the concert. They were amazing! So proud of this girl. As the New Year approaches, it’s once again time to revisit New Year’s Resolutions. I’m a big believer in them. Not that I always manage to keep them, but the new year does give you a chance to set some goals. I’m trying to keep them attainable. First off – waste and conspicuous consumption. Over the holidays hubby and I have been appalled at the amount of food that we end up throwing away. For some reason we’ve gotten in the habit of cooking for a crowd, even though there’s only two of us. We kid ourselves that we’ll eat up the leftovers or freeze a few meals, but not everything can be frozen and we get tired of the leftovers after a couple of repeats. So I’m digging out my Cooking for Two cookbooks and have ordered several more from the library. I will keep you posted on the successes and failures and will showcase some of my favorites recipes. And in the area of conspicuous consumption, instead of beginning new projects, I need to seriously look at the projects I already have started. I’m not too bad in the knitting department (although I do have a stack of shawls that just need blocking), but I have a boatload of quilt tops that need to be quilted and a brand new quilting machine that has been seriously underused. Gonna work on that. One of the first up will be the latest quilt that my Round Robin group worked on. We all used the same patterns, but our own fabrics. I’m going to continue to work on improving my knitting. I received my Level 1 notebook back from the reviewers, and as expected, I did have some resubmits. Five of the 18 swatches needed to be redone, and one remeasured. There were also a handful of questions to be redone. Most of the mistakes were due to carelessness or not reading the instructions correctly and were easily remedied. Thankfully, my report and the mitten project passed! The resubmits have been sent in and now we wait. 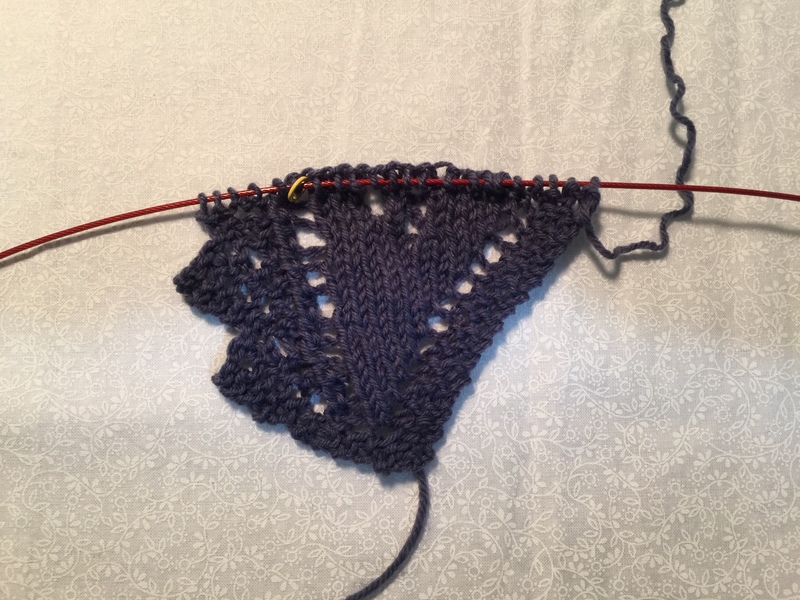 In the meantime, I’m continuing to work on my cardigan. Since the photo was taken, I’ve finished one sleeve and am working on the second. A couple of quick photos of our visit to my parent’s in Missouri. They are both doing well and are continuing to recover amazingly from the flood that almost destroyed their house about a year and a half ago. Although they lost almost everything, they have rebounded and are living in a very comfortable and cozy two bedroom senior apartment in the next town over. We were able to go visit the old house. They ended up giving the property and the shell of the house to the neighbor who alerted them to the flood and saved their lives. He has been working hard and we were so pleased to see that the house is once again a home! Contrast this to the last time we visited when the interior was down to bare studs and you could still see the mud line about 7 feet up the wall. I’ll leave you with some Christmas photos. It was a little low key this year. About three weeks before Christmas I ended up in the emergency room with a gall bladder attack. All that stuff they say about how painful it is? Yup – all true. Anyway, I got great care and they admitted me and did surgery even though it was after hours. Even better, I was ready to be discharged at 1:00 am and they didn’t make me wait until the morning, so I got to sleep in my own bed. I’m recovering just fine, but this is the second time I’ve had surgery right before Christmas and I hope not to make a tradition out of it! Well, here it is – the concentrated work of the last two and a half months. This is my Level 1 of the Masters Knitters Certification off to be reviewed. I do say reviewed rather than judged. My understanding is that the committee are not looking to ding you for every little thing, but to comment in such a way that you become a better knitter. I fully do not expect to pass on the first go-round. Hardly anyone does, but hope that the do-overs will be few. There is a bit of angst, and truth be told, a little bit of nausea in letting this go. It’s like putting your heart and soul out there on the line! Here is the project for Level 1 – a mitten. That cuff was a killer! I think I did it about four times before I was satisfied. Now I need to figure out what to do with myself. This has been pretty much all consuming. I did find time for a little pleasure knitting and am working on a cardigan for myself. The beauty of knitting top down is that you can try on as you go. Ignore the flaring at the bottom; that’s just the cable that’s holding the stitches. I also made Abby a pair of birthday socks, but forgot to take a picture of them. I really need to finish up my Christmas knitting. I’m done with the major part and just have fiddly finishing stuff to do. It’s probably not wise to save that until a day or two before Christmas. Yes, that is a Tesla Model S. It has been his baby for the last four years and when he ordered a new one, he wanted us to have this. This is something we never ever could have considered under normal circumstances and we are gobsmacked by his and Abby’s generosity! It is a dream to drive and we are having fun researching and learning all the features. Bill says it’s like driving the Starship Enterprise! We even have cute little his and hers key fobs. The car even recognizes them and will adjust all the settings (seat, mirrors, etc.) accordingly. Fancy! The one thing we are dealing with is “range anxiety.” Because it’s all electric, you can’t just pull into any gas station. But since 99% of our driving is within a full charge we should be fine. And as more charging stations are installed, our range should increase. Next week I’m off to visit my parents in Missouri. This is the second time we’ve visited since the flood. They’ve settled in very comfortably into their new place and the people who now have their old place have started reconstruction. I’m anxious to see that. It was so sad last time we saw it. Not sure if I’ll have any internet connection while we’re there, but I’ll blog if I can. Ok, so I’m going to try out blogging from my iPad. If that’s a go, I’m sure I will be posting a lot more. One of the fun things about transferring over to WordPress was going back over my posts just to double check that all the important stuff transferred over. It was so fun to read about meeting Abby for the first time and about the births of the granddaughters. Hmm – it seems to be a recurring theme, doesn’t it? I think a lot of my non-knitting friends (and maybe even a few of the knitting ones) have considered me a little crazy because I really do like to knit with teeny tiny yarn on itty bitty needles. 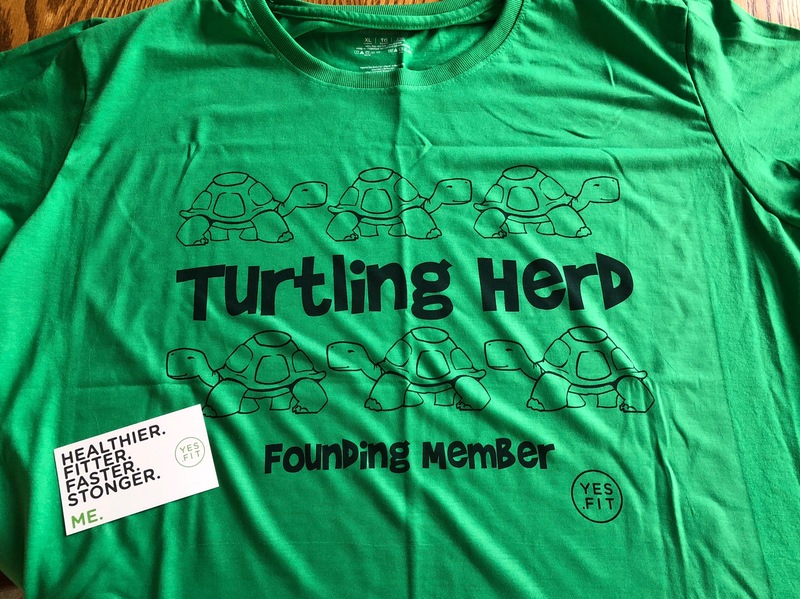 But I’m pretty sure many will think I’ve finally jumped the shark. On a whim (scary, how that happens), I have enrolled in the Master Hand Knitting Program with the Knitting Guild Association. This is in three levels, with Level I allowing one year for completion, Level 2, eighteen months and Level 3, a full two years. So why, you may ask, do I want to do this? Other than the obvious “personal satisfaction” answer, there are several reasons. One is that I want to prove to myself that I can continue to do something hard. At this time of life, it’s easy to just settle back and coast, but I don’t want to do that. Another reason is to become a better knitter. Now, I know, I am constantly told by people that I’m the best knitter they know and I have a whole box of blue ribbons to prove it. But I’m realizing that after over 50 years of knitting, I can still improve and I can still learn things. 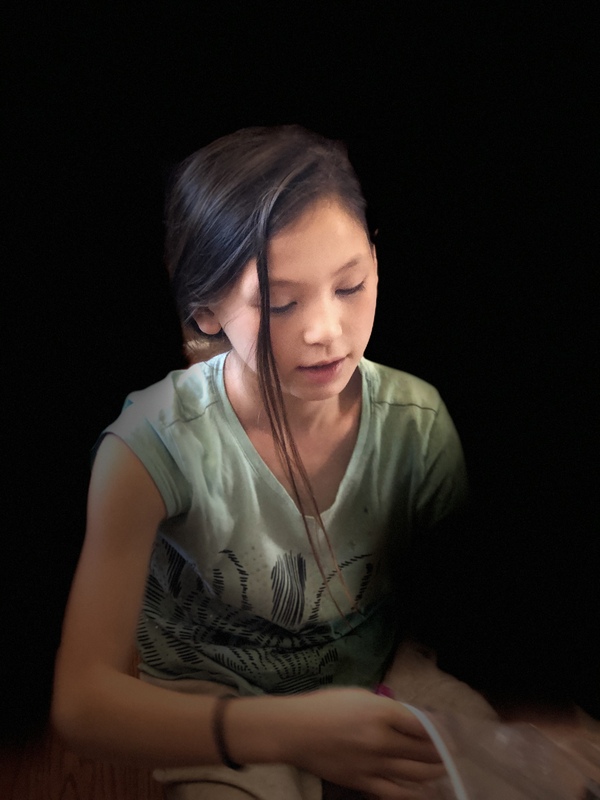 One of the candidates for the program related that she received her first Level back with several items that she had to do over and resubmit. She was so angry she shoved it in a closet for a month. She fumed because she was one of those “best knitters”, had won all sorts of ribbons at fairs and who did these people think they where? But then she realized they were right. She was resting on her laurels and expecting to get by on reputation alone – and she had gotten sloppy. Level I really goes back to the basics and already I’m learning better ways of doing things. There is a ton of book work on this – it’s not all knitting. You basically have to write a short term paper (with citations) on blocking and every technique you show has to have at least two references. 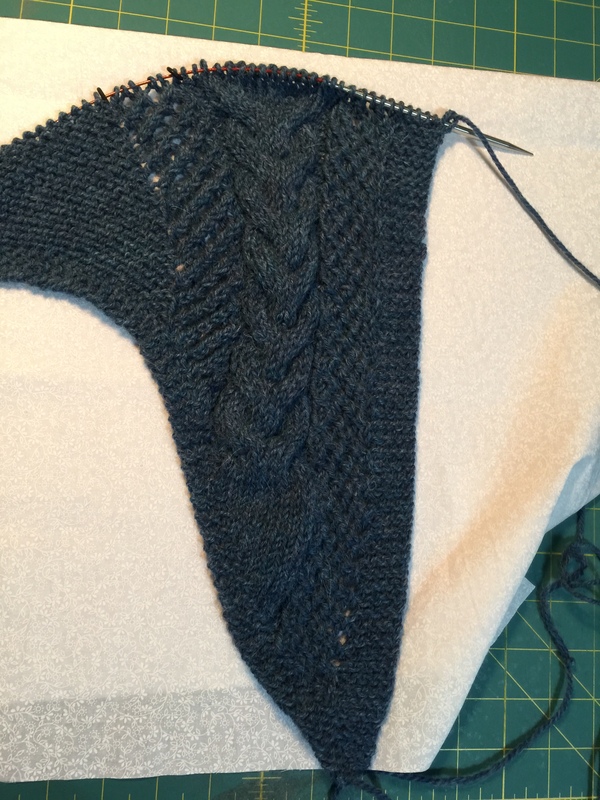 I know – wordy post and not a lot of pictures, but my knitting nerd friends will probably enjoy it. For the rest of you – hubby and I celebrated our 46th wedding anniversary on Sunday. 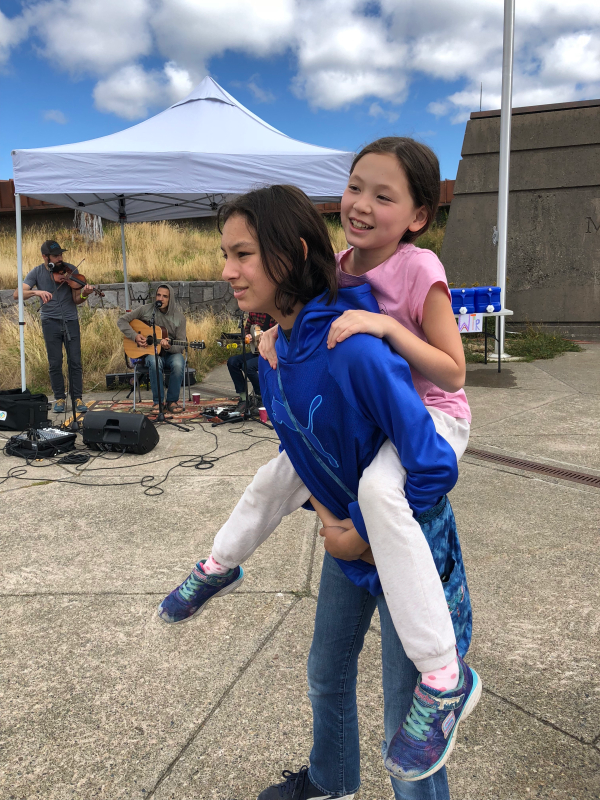 We went out for a nice dinner at Callen’s by the Port Townsend ferry dock. So much fun to sit and watch the sunset and the ferry come in. And the food is outstanding! I highly recommend it to all locals. Well, it's only been about 5 months since my last post, so I suppose I'm getting a little better! Yesterday I decided I needed to inventory my shawls. 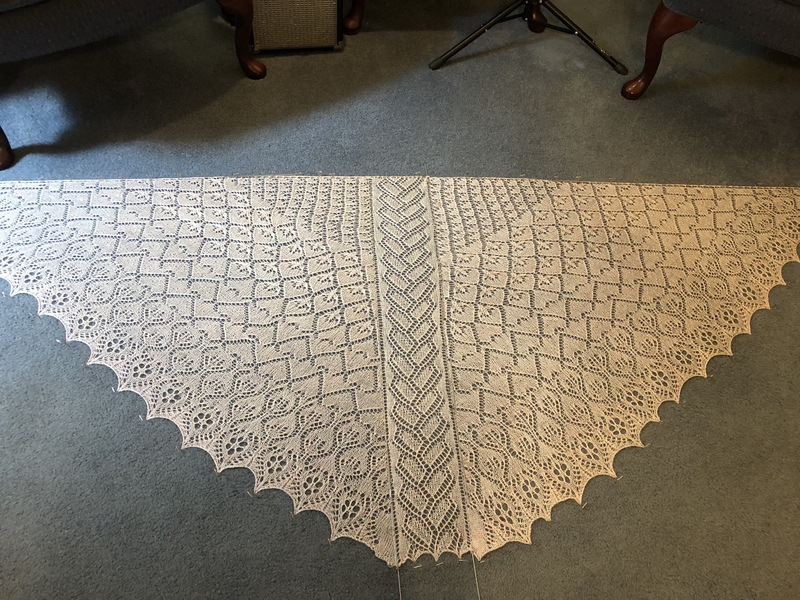 I really, really love making them, but I have so many and can't possibly wear them all, so I wanted to see which ones I could put aside to use as gifts, prayer shawls, etc. Not only did I discover a lot of finished shawls, to my dismay I discovered a whole pile that had never been blocked! That's not actually the whole pile – I had blocked two of them before the picture was taken. 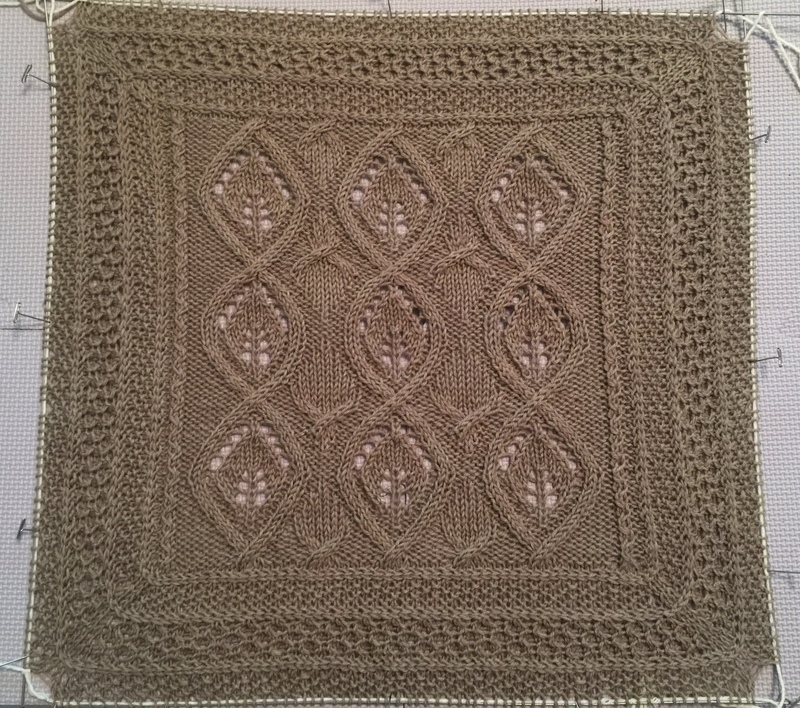 To the uninitiated, blocking is what takes what looks like a crumpled pile of dental floss and turns it into something magical and ethereal. However, it also involves crawling around on the floor with a gazillion T-pins and your knees screaming for mercy! Also, since the only place I have large enough to do this is on the floor by Bill's side of the bed, it needs to be accomplished first thing in the morning so it's dry by bedtime. Don't want him getting up in the middle of the night and impaling himself on T-pins! The subtle shades of tonal pink don't show up well in this photo, along with the almost 1,000 beads. The beads give it such a beautiful sparkle and weight and the silk yarn is delicious. It was a little slippery to knit with, but well worth the effort! This also has beads, although not quite as many. The yarn is also a little heavier weight, but still lacy and lovely! 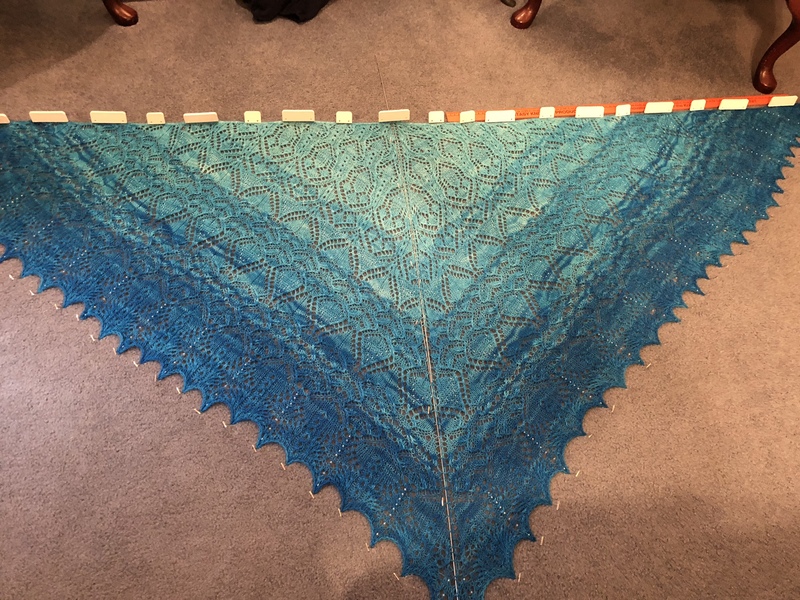 The pattern is Loopy Tulips by Jaimie Davis. I haven't yet decided whether to hand or machine quilt. I would love to hand quilt it, but my hands are not as cooperative as they used to be. 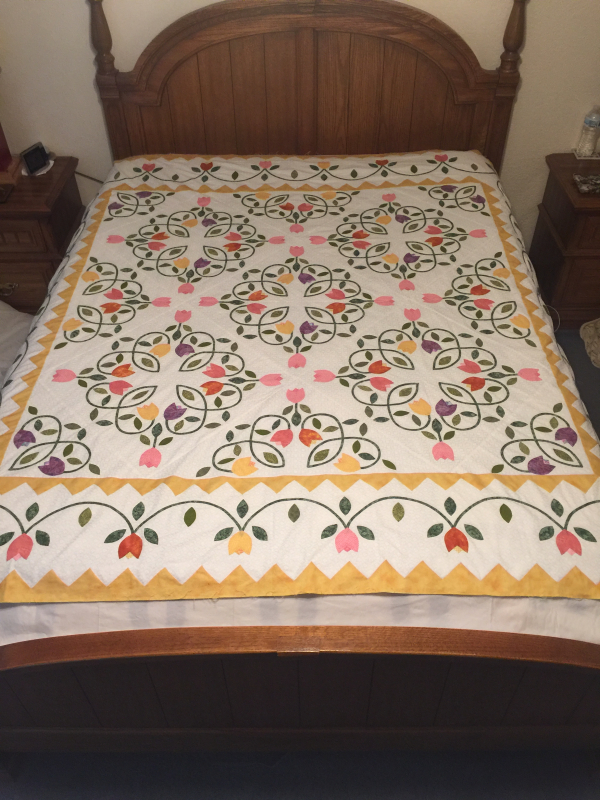 I also finished the center on my Bed of Roses quilt. This pattern is by the super talented appliqué artist Sue Garman, who sadly passed away recently. I will almost certainly hand quilt this one. 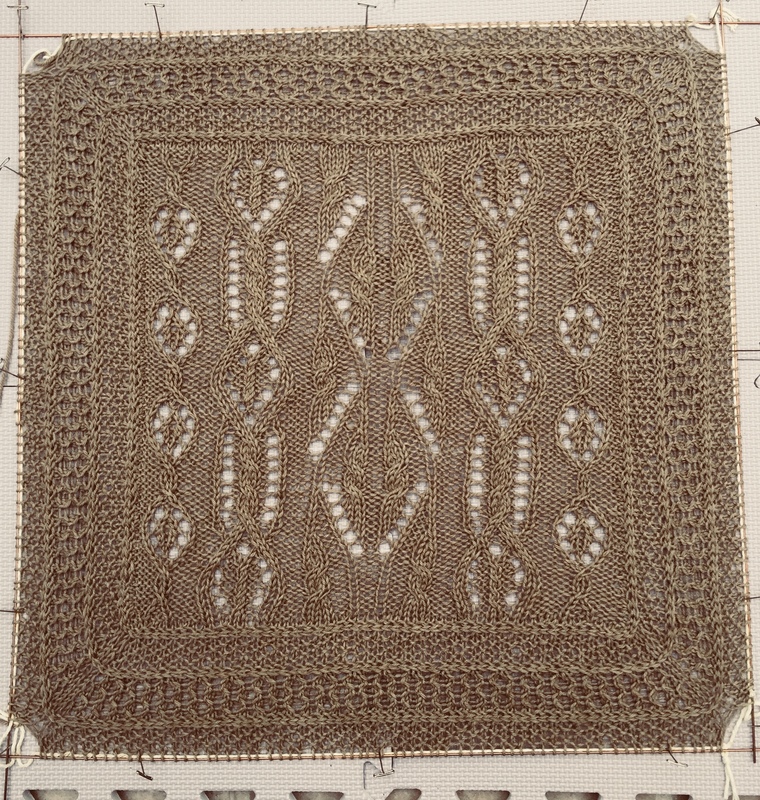 The border is all done, except for the corners and I hope to have them done in a week or so. I'll leave you with some photos I took of the granddaughters here at home and on our trip to Mt. 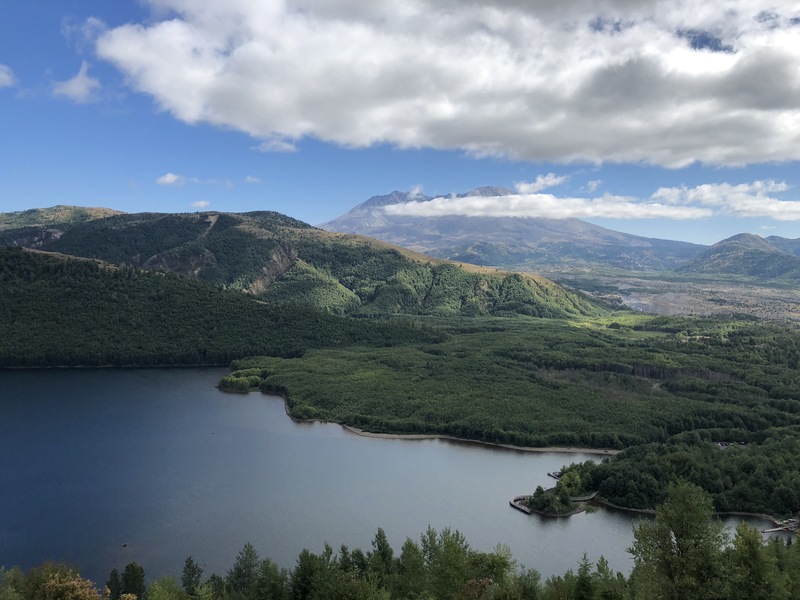 St. Helens last week. We stayed at an Air BnB that had a built in menagerie and the girls were in heaven. They are indeed getting grown up. 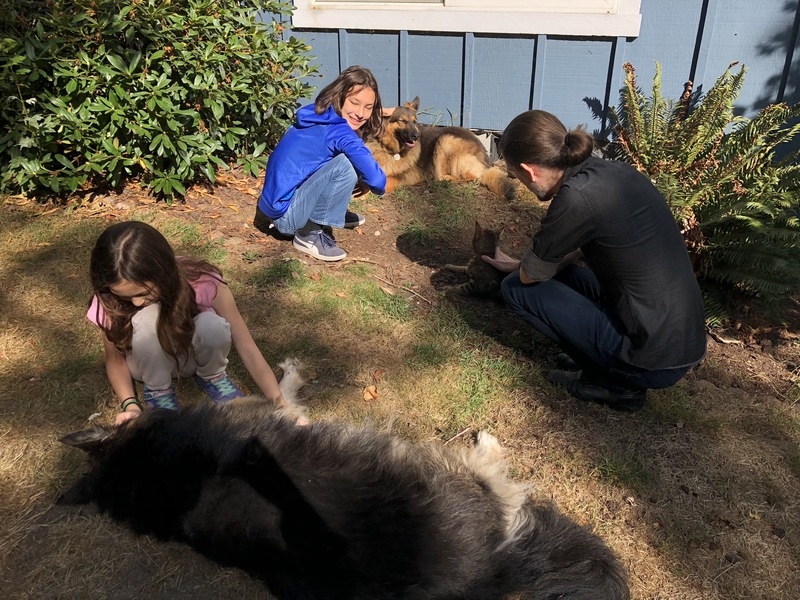 Isobel is now a teenager and Ivy will turn 11 in just a few days. 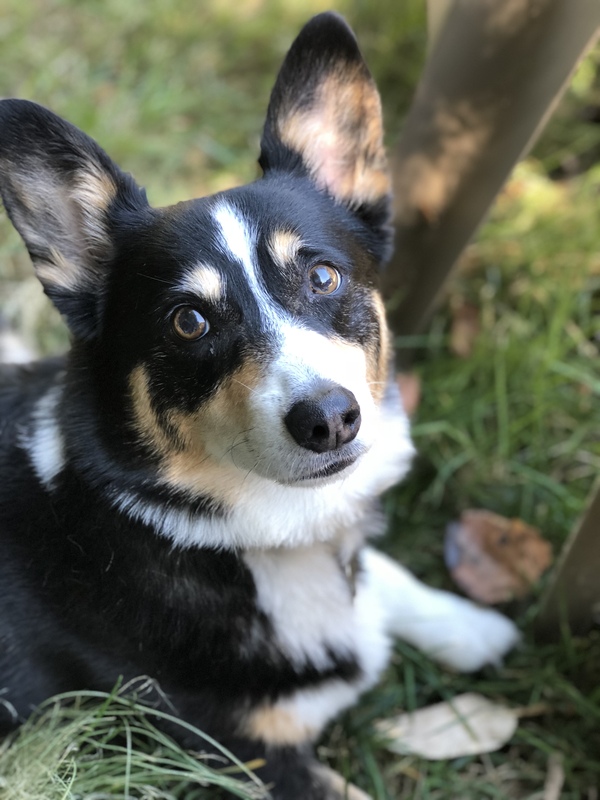 Oh, and one of Maggie for good measure. A view of Mt. St. Helens from the observatory deck. When I first started my blog, it was mainly a knitting blog and I met many new friends this way. I remember at first it was a little scary and when I headed off to meet one of them in person (Hi Li!) my friends thought I was a little crazy. I told them it was improbable that an axe murderer was going to arrange to meet a middle aged woman in a yarn store! Fast forward fourteen years (yes, I've been blogging that long!!) 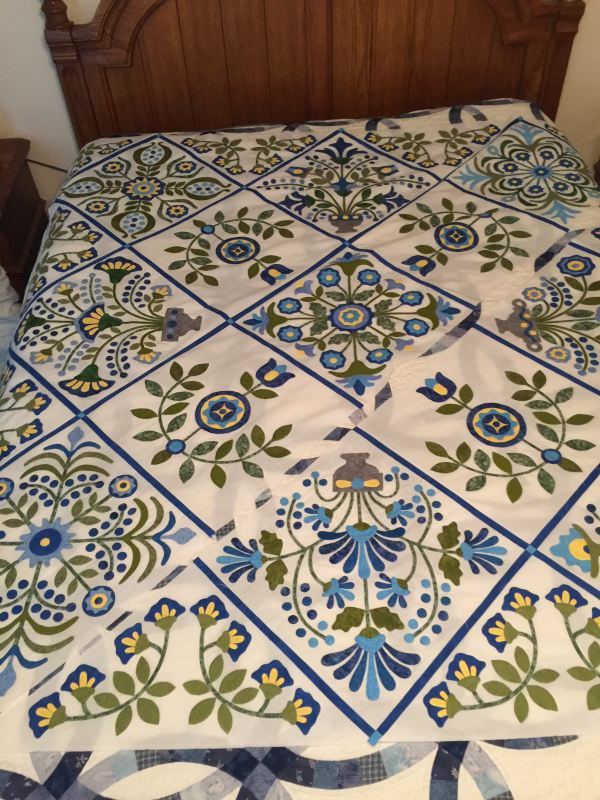 and the blog has morphed into other areas as well – music and quilting and I'm sure lately my knitting friends have wondered if I've abandoned knitting altogether. Never fear. Like many things in my life, I go in cycles and knitting is starting to make a comeback. One of the reasons I haven't been knitting much is the lack of a project that really intrigued me. I was working on a Jared Flood afghan and while perfectly lovely, it was the same thing over and over and over. It got to the point where I'd rather poke a knitting needle in my eye than work on it. 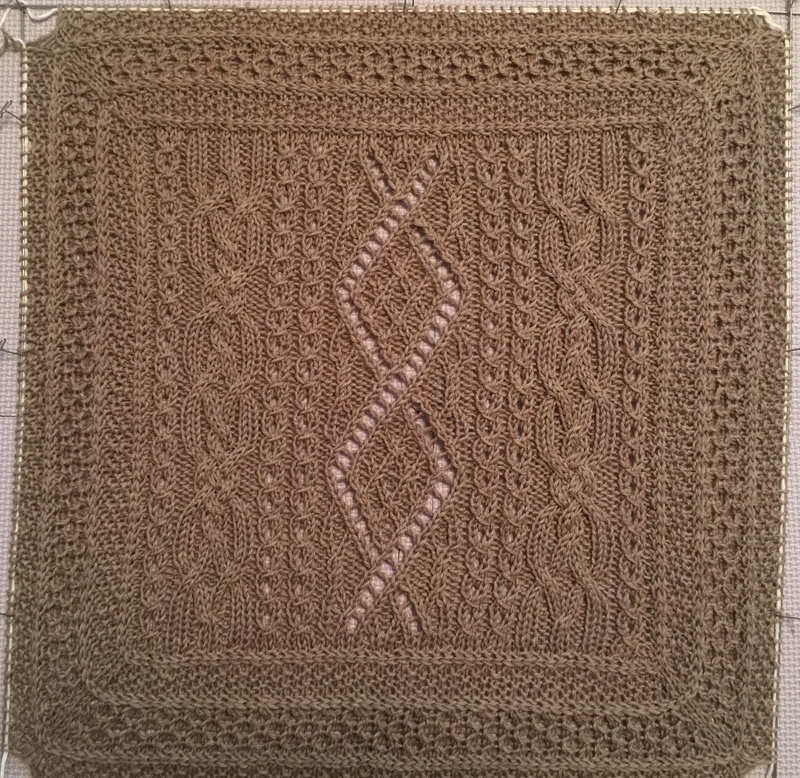 While wandering around on Ravelry I found the pattern for A Celtic Quilt 2 and I was smitten! 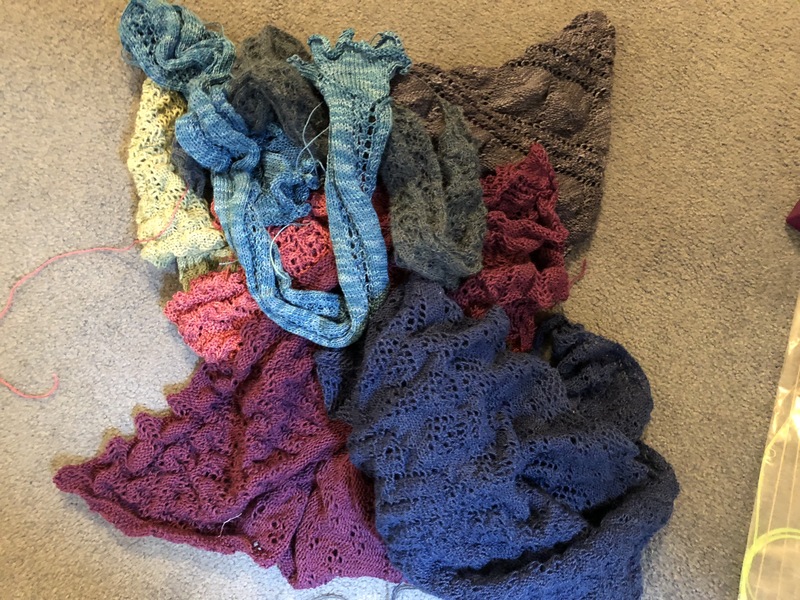 Not only are there multiple different designs, but they are smaller squares that are not sewn together, but attached with a 3 needle bind off. 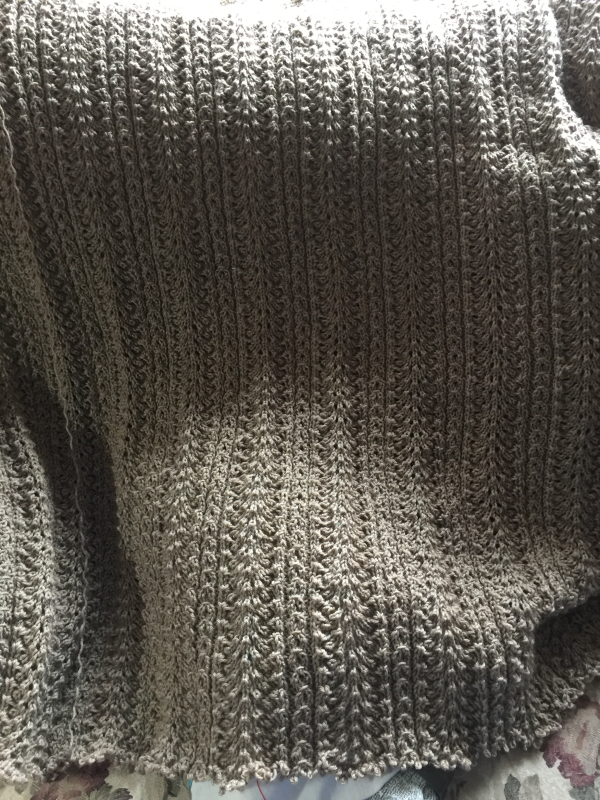 So here's the crazy part – I frogged the other afghan. I know, non-knitters are probably aghast at the "waste" of all that time knitting on it. But I think knitters will agree that there's no point slogging along on a project you hate when you could be doing something much more fun. So far I have 3 squares done. The middle photo is the most accurate for color. Oh, and I may have cast on a couple of Dee O'Keefe shawls too. The first is Anisah and the second is Katania. I have to admit Katania is a little boring, but between my husband and friend having cataract surgery, I've spent a lot of time sitting in doctors' offices waiting and it does pass the time. A couple of quilts have made it off the UFO pile, too. 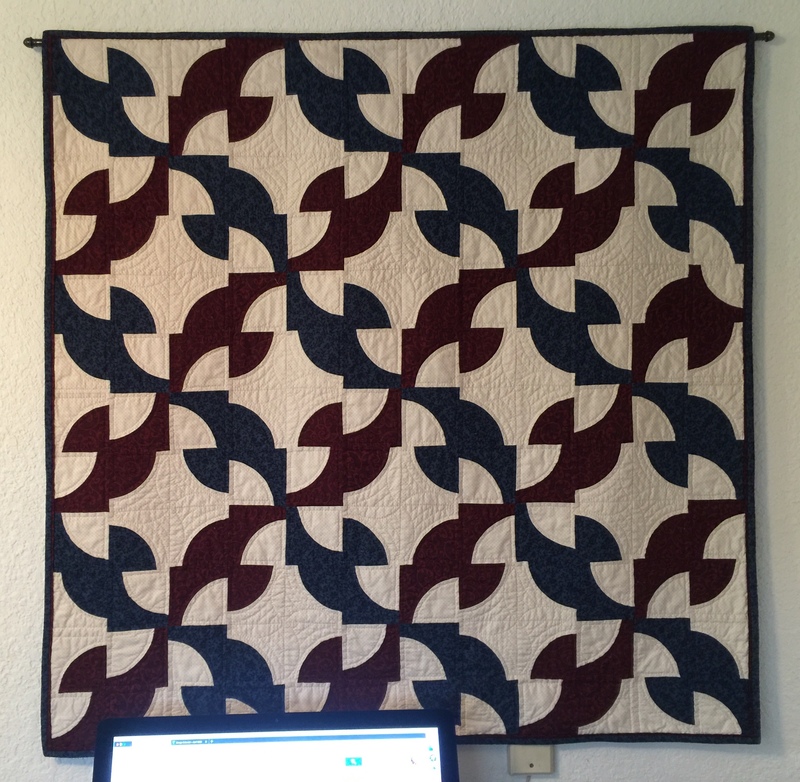 The first is a quilt requested by hubby to hang over his computer desk. The pattern is Drunkard's Path (his choice! ), but I think the dark patches look like birds. 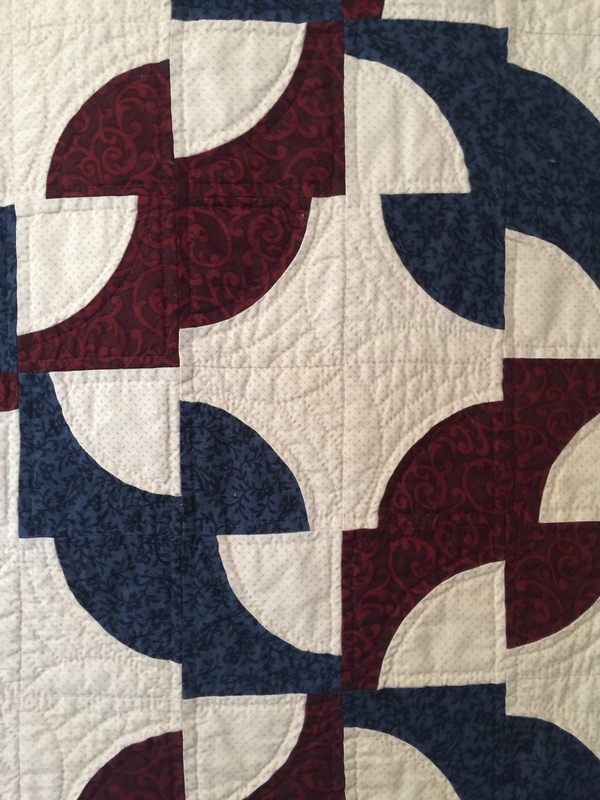 I quilted the light squares to look like airplane props with the wind flowing around them, so I've named it "Air Birds." The other is a quilt made with my Round Robin group. One of the ladies brought back fabric from Alaska for each of us. 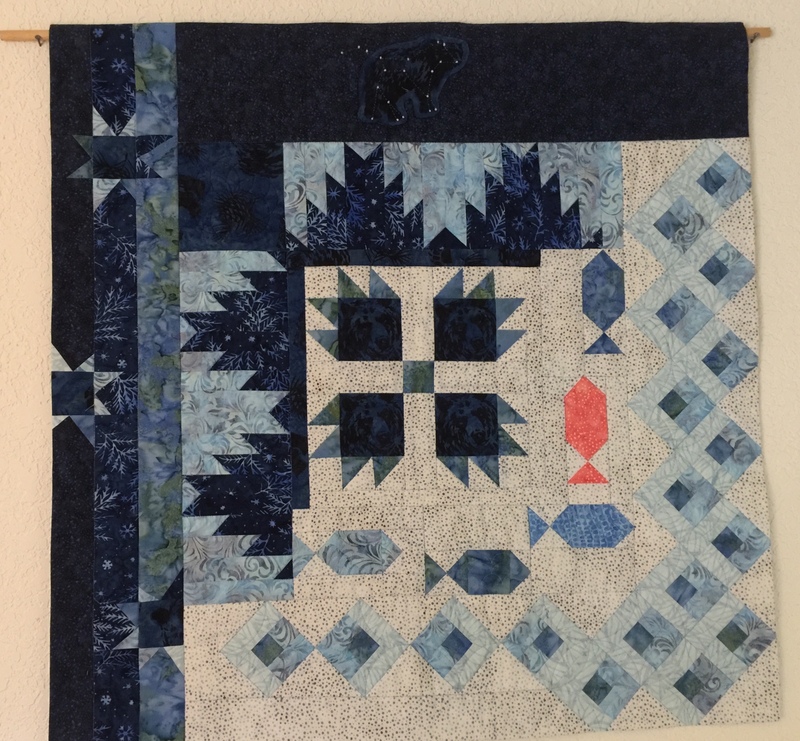 Mine was a batik with grizzly bears, so I set them in a Bear's Paw block for the centers and the other members added the rest of the borders. The last border has the constellation with the bear in the sky, so I have named this one "Ursa Major." I especially like the pink salmon swimming upstream. I couldn't figure out how to bind it with the stark difference in colors, so I faced it instead. It's the first time I've done this and will use this technique again. 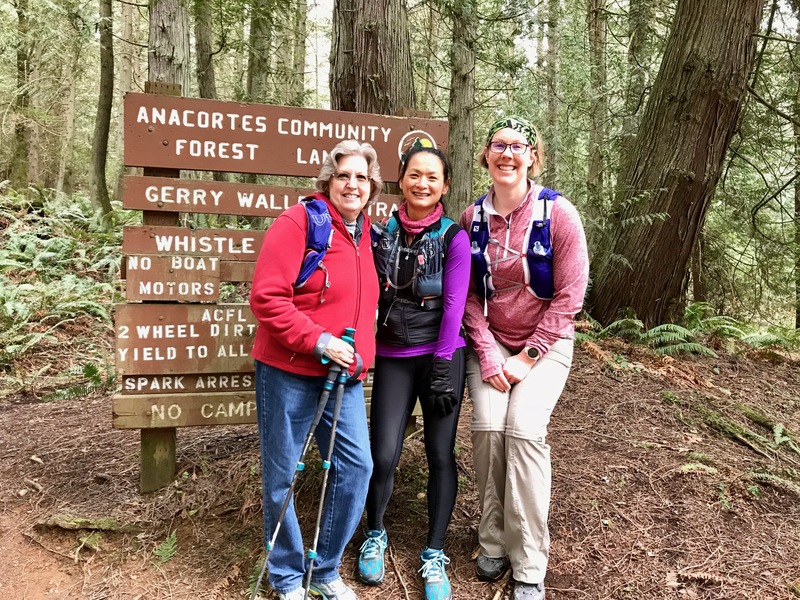 To combat all the hours spent sitting and sewing/knitting, I've been trying to get out more and have done a couple of hikes with Abby. 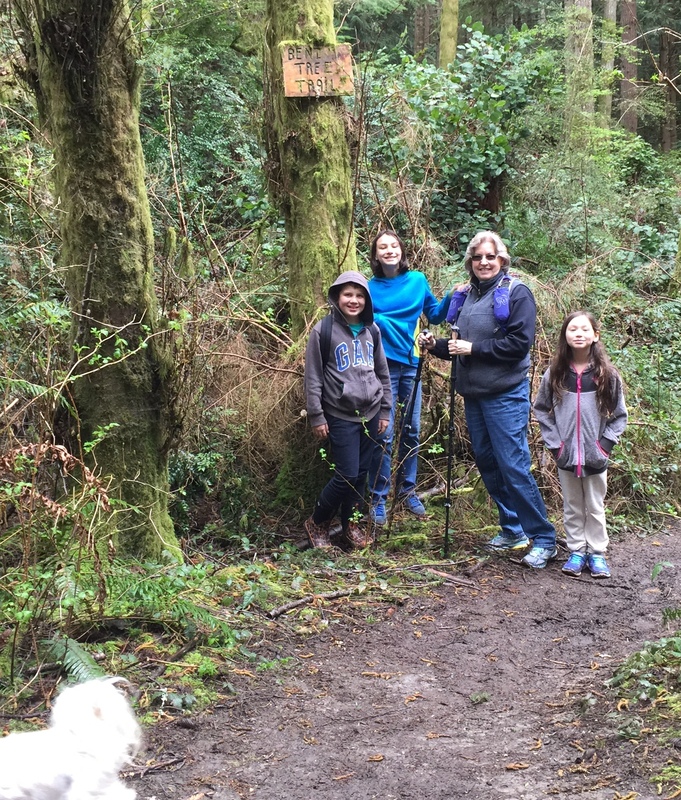 The first really challenged me – it was a 5 mile "moderate" hike (although for me it was more like "difficult") and the second was truly an easy two mile stroll with the grandkids. That's it for now. I think I may take some time this week and go back over my blog starting from the beginning. It's so funny to think that when I started it, we hadn't even met Abby yet! So much has happened and it will be fun taking a trip down memory lane. Ta ta for now!